As you may have picked up over the hundred or so blog posts, I am more of a system kind of a guy: Bricks, studs, 3.18mm bar and clip, mini figures, creator, friends, elves, superheroes, video games are my normal thing. I have never really been invested in the constraction (constructible action figures) figures: Bionicle passed me by, Super Heroes happened in the background, Hero Factory came and went, and then Bionicle came and went again. And in the meantime, Star Wars characters started to get a go at it too. I recognised around half of the pieces by type, due to brushes with technic in my youth, as well as occasional implementation of play features in various sets. 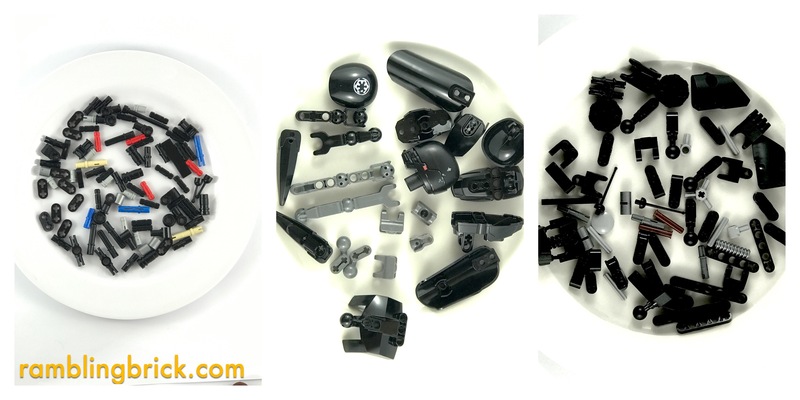 Only seven different pieces in the parts list connect primarily by studs or 3.18 mm clip/hole type connections. The rest are relatively unfamiliar, although the way in which they integrate with other pieces is fairly intuitive. Of interest, the minifigure rapier accessory appears here in black for the first time. Connection between structural elements is typically using 2 stud long axles, (occasionally longer), ball joints and various rivet type connectors. This set comes together fairly easily, rapidly implementing the friction cup, which I reviewed a few weeks ago, to keep the ankles sturdy. The knees have interesting flanges on either side of the ball to reduce any significant valgus or varus instability of the knee (knock kneed, or bow legged respectively). A ball located mid shaft allows the leg armour to just clip on. The pauldrons, and some of the other panels attach by means of two 3.18mm bars, one stud width apart connecting to the the holes in studs, or rivet connectors. A three branch cross axle (w/ Cross H!) forms the hips and the base of the spine. The torso has an interesting constriction which allows a ‘push on the back punching action, just like real 12″ action figures of old. No kung-fu grip or bionic vision however. The arms are awkwardly proportioned, with the forearms disproportionately long. greatly enhance the look of his chest-plate. As a constraction figure, K-2SO is well balanced: standing on his own 2 feet and being able to adopt a number of dynamic poses. This serves to make this set more like a regular action figure. The 14 points of articulation can all be put to great use, conveying great subtlety of posture and mood. And it is in this way that I find the constraction/buildable figures to be most appealing- a great deal of message can be obtained from a nod or change on leg posture. experimenting with postures and expression. particular type of set design, I appreciate some of the advantages in building a figure at this scale. I would love to see an Iron Giant build this way, to then interest with regular minifigs as the humans. It is difficult for me to appreciate the subtleties of buildable figure design. This one comes together nicely, comparing favourably with the source material, and is extremely poseable. If you are looking at entering the world of constraction figures, you should certainly consider K-2SO. I give him 4/5 Arbitrary Praise Units. A good set, perhaps not the best in class, however I am limited in constraction experience. I enjoyed putting it together, but the real joy for me comes from using him as a photographic model. Are you a fan of these sets? How about other constraction themes such as Bionicle and Hero Factoy? Why not yet me know in the comments below, and don’t forget to subscribe. I’ve never really thought about purchasing one of these sets, but now I’m thinking again! This one looks like a lot of fun – would be great as a desk buddy. Great article, Richard, as always! I really think this build is a necessary one for me. And you are right about the poses and the photographic element – this feeds right into my main Lego addiction (as a Lego Photographer).